Lynx, in Cloud's band, could be removed next year as a yearling. Even before its grand public opening on the National Mall, the new Martin Luther King Jr. monument in Washington, D.C., has attracted controversy not only for its imagery, but also for its creator: a Chinese master sculptor named Lei Yixin, who worked with a team of craftsman in Hunan province to carve the 30-foot-tall work. Some critics have said that, given his nationality, Lei is an unorthodox choice for a monument memorializing an African-American hero. Inspired by a line from King’s iconic “I Have a Dream” speech, the “Stone of Hope” sculpture depicts the civil rights leader emerging from a block of white granite. Standing stiffly to attention with arms crossed and a serious expression on his face, King is depicted as stern and authoritative. The statue oddly seems to evoke Social Realist monuments — an impression heightened by its monolithic composition, with King standing as part of the rock face. Photographs show the memorial already easing into its place on the Mall alongside such company as the Washington Monument (both of which sites were closed due to today’s brief earthquake). Attending an art university directly after the ravages of the Cultural Revolution, Lei Yixin graduated in 1982 and went on to work as a draftsman, and was later encouraged by a government official to move into designing public sculpture. Lei has created over 150 monuments, including statues of Mao Zedong. But it was the artist’s 2006 “Contemplation” sculpture that caught the eye of Ed Jackson, the executive architect of the Martin Luther King Foundation, who named Lei the head sculptor for the “Stone of Hope” monument in 2007. We were a bit surprised that the music behind this video is mainstream white-bread. Say what, NO GANGSTA RAP. No one wants to defile MLKs Virtual Memorial? The MLK statue reminded me of one of my favorite sculptures, from Loveland, Colorado’s Bobby Carlyle. Click on the photo for more information. “How do you write women so well? This story was first posted 8/16/2011. You’ve heard of “Bad Boys”, right? You’ve probably even met some. Ah, you’ve dated one? Then you’ve got some scars in your heart to remember him by, don’t you. You say you were his girlfriend? No, sweetie, bad boys don’t have girlfriends; they have women, lots of women. Because women, all women, can spot a bad boy a mile away, and whatever hormone fragrance she puts out when she sees one is picked up by him immediately, and bam – she’s a target. There he is – the bad boy – standing on the other side of the room. He may be wearing a black leather jacket or not. Even if he’s not, and say you’re a beautiful, smart and enchanting female who can have her pick of any guy in the room, you want him. And only him. And suddenly you’re not thinking about relationships or marriage or kids or contentment or happiness. In fact, you’re not thinking at all; you’re operating from something other than your human mind or human heart. You are operating from what psychologists call the Reptilian Brain, that lower part of our brain where our basic instincts dwell. But, you say, what about those psychologists who tell us that being abused when we were children is the reason that bad boys are bad and that some girls are attracted to them? In terms of bad boys who are actually abusive and women who are drawn to being abused, yes, there is more than something to that. However, I’m talking about the essence of “Bad Boy” here; not psychopathic nor criminal behavior. I am talking about the energy and the essence of bad boys, including the energy and essence of all the bad boys out there who are not criminals nor have ever physically or verbally abused a woman. This energy and essence is in his genes and he’s hooked into it. He’s got it. You may not consciously know what it is, but you know that he has it. It comes across in the way he dresses, the way he moves, the way he talks, the way he looks at you. He’s confident, he’s independent, and he lives by his own rules. 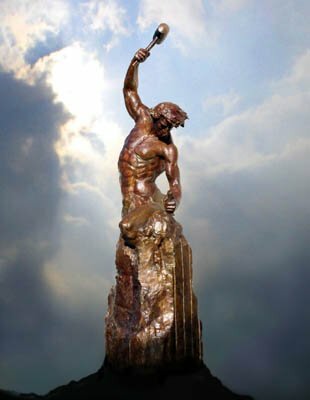 Most of all, he manifests that intense masculine energy, and it doesn’t show up simply in how he presents himself to the world; it is seeping out of his pores. And, in order to keep the species going, your Reptilian Brain tells you that you absolutely must mate with this alpha gorilla. So, you do. And then what happens? Do your human mind and heart finally kick in, telling you that you’re so totally in love with him and that you can’t live without him that you need to embark on the project of changing him into a loving and caring husband and father? Some projects in life can be completed. This one can’t be. You can’t change him. You can’t turn him from an alpha stud preying on women into the Prince Charming you’ve always dreamed about. Prince Charming he most definitely is not. Sounds trite, but it’s true – only he can change himself. But won’t your love change him into a caring, emotionally open guy who will pledge his undying love to you and take great care of your mutual children? Nope. Because your love ain’t getting through to him, sweetie. He’s walled in, and his emotions are not coming out to play. Can he change? Sure. But he’s the one who has to feel the need to change, and do all the work to change, and it’s probably going to come, with time and age, from the pain he feels from being emotionally isolated. Original post from AP – Thursday, July 21, 2011 | 11:05 a.m.
YouTube Video is from brad88ford. Caesars Entertainment claims its no-fees policy saves travelers $3 million per month. In the midst of Denver’s Little Asia on Federal Boulevard in Denver, Colorado there’s a Crawling Crab. Actually this small, hip, modern, Cajun-seafood restaurant beckons customers with a bright-red Dungeness Crab on the sign. Funny how one can judge this restaurant by it’s cover (facade.) It’s a good facade. Wooden dock-pilings, heavy ropes, even a Captain’s Wheel and a shark gives one a not-so-subtle hint that this is a restaurant where one may find seafood. Blue Crab, Dungeness Crab, Snow Crab, King Crab Legs, Lobster, Crawfish (in season – call,) Shrimp, Clam and Oysters are on the menu – served with a choice of four different seasonings, such as RAJUN CAJUN, in varying degrees of heat (mild, medium & hot.) Market Price is the going rate for most of the above. The shrimp runs around $8.99 for a full pound, and they are huge. then there’s Gumbo, soups and salads, and beer – the only adult beverage at the present time. Back to the shrimp, which I shall do (in actuality) A.S.A.P. – the pound of huge: heads, tails and shell-on boiled shrimp is served in a plastic bag (double-bagged) swimming in sauce, which, in my case, was The Crawling Crab’s All-In sauce which consists of, as the name implies, a measure of each of the three sauces, or… Let me say that this was the best – quality and value – shrimp dish (even without the dish) I think I’ve ever had. The shrimp were large, fresh and firm, the sauce was delicately seasoned, yet fully flavored, the portion was HUGE. I’m thinking at least a dozen large shrimp for $8.99. Bet this price won’t last. I was very happy with my dinner. View the complete menu on the Crawling Crab’s Official Website. If you want metal flatware, you may have to bring your own. I didn’t see any, nor did I see any glassware. The good news is that there’s a roll of paper-towels – à la Hooter’s – and you will need it. You’ll leave the table several times to wash your hands and face at the convenient wash-station on the south wall (rear-right in the photo). Perhaps one of the most appealing things about this neat, little restaurant (besides the food) are the bright, intelligent, smiling faces of the largely Asian clientele, happily working on their meals – wearing the Crawling Crab’s plastic bibs. The owner, Anh Nguyen and staff are also Asian. Parking in front, booths and tables, several large screen TVs and friendly staff help make this restaurant a success. “The writing is on the wall” simply means that customers are encouraged to mark the walls and the butcher-paper on the tables with a black marker. One can see this garish, gastronomic, graffiti in the photo. Well, this is what we should do: We all should step outside our front doors at the second hour past the time that darkness has settled – on the night of the full Moon – at the top of the hour, and celebrate the full Moon together. Sort of a global, Full Moon Kirtan. Don’t worry you won’t get lost, just let the wind guide you. HAVE YOU HUGGED YOUR MOON TODAY? The Moon will be 100% Full: Saturday * August 13, 2011 * 10:57 A.M. Las Vegas time. 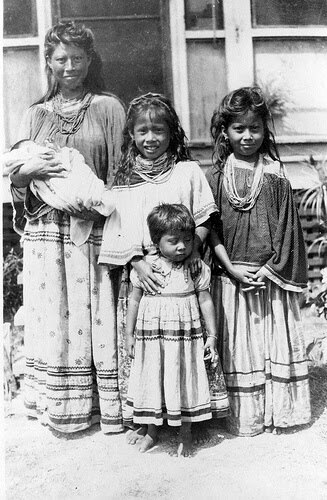 Two Native tribes are mentioned here – click the WWU link to access more information. Writing about Native Americans prompted me to include the following links to a truly great Link, LINK WRAY, that is – The FATHER OF EDGY, ELECTRIC, EAR-SCRATCHING ROCK & ROLL. LVBC note: The WIKI page downplays the fact that a guy by the name of Jørgen Ingmann [a musician from Copenhagen, Denmark] recorded Apache in 1961, which climbed to #2 on the US charts, the only charts that really matter, according to some. Apache was among the first records to use sophisticated electronic recording techniques, if not the first. An afterthought reminds me that Santo and Johnny’s SLEEPWALK preceded APACHE by a few years (1959.) Sleepwalk is probably my favorite all-time guitar instrumental. Every guitarist could play it because of it’s simplicity, however Link Wray was the innovator. The song was part of the soundtrack of the film, PULP FICTION. The electronics-heavy APACHE was also part of this genres foundation. Both songs used cutting-edge electronics such as “tremelo” and echo. This article is from The Navy Seals Foundation’s Official Website. The Navy SEAL Foundation is proud to serve the Naval Special Warfare community including the U.S. Navy SEALs, SWCC, NSW Support Personnel, and their families. The loss of the U.S. Navy SEALs in Afghanistan is the kind of news the Navy SEAL Foundation fears—but prepares for in our mission to provide immediate and ongoing support and assistance to the Naval Special Warfare community and their families. When a member of the community falls, the Foundation helps the families with memorial services and defrays the financial costs of travel for immediate family members who live far away. These warriors were at the tip of the spear in the global war on terror, exhibiting extraordinary skill, courage, and commitment. It’s paramount for the Foundation to support their families here at home. When a warrior falls, the Foundation is prepared to take the burden of cost away from the families and help them with planning. The families will have enough to concern themselves with during this time. Our deepest sympathy is extended to the families of those who lost loved ones in this devastating tragedy. Please know we hold you close in our thoughts—and are here to help you in the challenging times ahead. Here’s a way to quickly donate to the Navy SEAL foundation using your cell phone! Text “SEAL” to 90999 to give $10 to help support the Navy SEAL foundation! It’s quick, easy and your donation goes a long way to help us with our mission! Caesars Entertainment aims to start work this month on the $500 million entertainment, retail and dining complex known as Project Linq. Posted: Aug. 5, 2011 | 2:01 a.m. 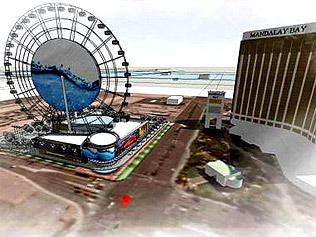 The question over competing giant Ferris wheel-type projects on the Strip comes down to who has all their bearings. At least, that’s what developer Howard Bulloch says. Bulloch, who is behind the Skyvue development on the south end of the Strip across from Mandalay Bay, said he has acquired the two giant 23,000-pound bearings needed to operate a 500-foot tall London Eye-style wheel that is the centerpiece of the project. He unveiled one of the bearings back in May, when he announced plans for the $300 million retail and entertainment space. He brought up the issue of bearings on Thursday, the day after Clark County approved the land use and design for Project Linq, a $500 million complex being developed by Caesars Entertainment between the Flamingo and Imperial Palace, that includes a 550-foot Ferris wheel as its centerpiece. Bulloch didn’t know whether Caesars had acquired their bearings. “The two large bearings take 18 months to manufacture,” Bulloch said. Caesars spokesman Gary Thompson said Thursday that the company is planning to reveal more details about Project Linq during a briefing on Aug. 17, including the technological aspects of constructing the observation wheel, which would be larger than the Singapore Flyer and the London Eye. The wheel’s 32 cabins will each carry up to 30 people.